Don’t know about you, I could use some break. This post of yesterday – such comments are always taking me a bit off-balance. Not that I’m very balanced lately. Balance is not interesting anyway. So I did what I always do lately, created some new tech issues with the new parents site. Try it, that’s when you lean back in your chair and let other people fix what you ruined. That is great, take it from me! I’ve started doing it on purpose, see? Wind chimes. I was leaning back thinking I need to relax, and suddenly heard the wind chimes from outside. It was like someone heard my thoughts. I’m already planning to make wind chimes with my kids for the last 8 years, So I’m sure it will happen very soon. 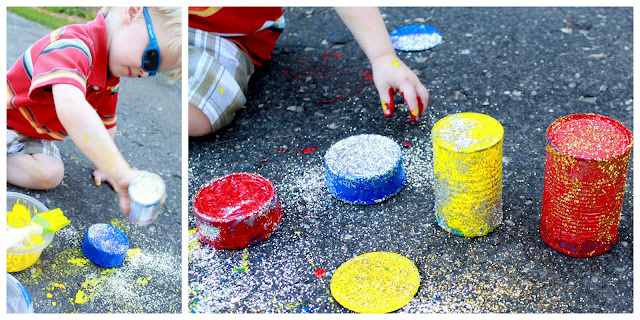 I collected for you some amazing ideas that you can show your kids, and promise to do with them during the next weekend. This way I’ll not be the only mom always making promises. Pencils! Creative isn’t it? Did they mean to show boys and girls chimes? Probably not, in any case I’m not sure about the noise effect here, but it looks great, and not difficult to make. When you finish your pasta, that’s a great use for the pasta bowl! Look at these tin chimes, see this adorable kid with blue sunglasses 🙂 Looks like this is one picture that was carefully planned… Just Love it! Not so crazy about the outcome in this case, but I just love the idea of using the paper eggs box for a mobile or wind chimes. This made me laugh. Suggest you do it with Coca Cola cans instead. With the kids, I mean. You helped me relax now, thank you! Back to making some more programming mistakes. Take care all. I love the sound of wind chimes too, esp. the tinkling kind =) & it’s a good idea to make them too since some of them are so ridiculously expensive! All the best, D.
I admire what you are trying to do with the blog…and sometimes, the best you can do is to walk away from a project…do something completely different, anything but think about the project. And somehow or another the synapses start popping again and forward progress can be made. That was a nice wind-chime moment! Thank you! You should see a reblog botton at the top. You have reminded me of the wind chimes and tee shirt I purchased at The Passion Play in Eureka Springs one year as a present to Jesus. When the wind chimes chime blown by the wind it is like Jesus singing to me calming my rough sea. I hope the woman is given an answer to her daughters distress. There are many young going through tough times that other young have made it through and need support from others who have been there and found hope. I really laughed when I read this post! Especially when you mentioned the planning for the last 8 years crafting. Well, I have to confess you are not the only parent in this category and I can’t even figure out how to install a widget! Hats still off to you! 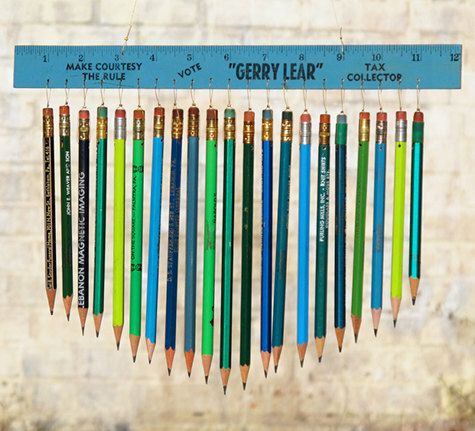 Love the pencil wind chime – will keep it in mind for an activity with the kids – should get to it sometime in the next 8 years! Love it! Definately will try one of this in my daycare. Love the redneck windchimes — gave me a midday laugh too! I *love* this! I started collecting wind chimes a few years ago, yes, I only started with one I found at a St. Vincent de Paul thrift store. It was a GREAT way to bring peaceful sounds into a very loud city neighborhood. Now, I look for them at yard sales, rummage sales, you name it. I love the huge ones that make a deep tone, but my gosh, they’re expensive! One at Costco recently had a $99.99 price tag. OMG! Fun, colorful and cheerful! Nice to visit a happy post and learn something useful along the way! very nice the tin chimes! never thought of that! super thanks for the great idea! 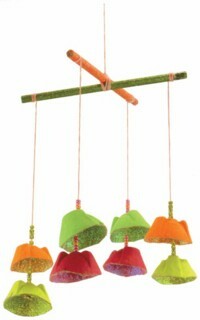 Bamboo chimes are on my to-do list ! The redneck one made me laugh! Thanks for that. 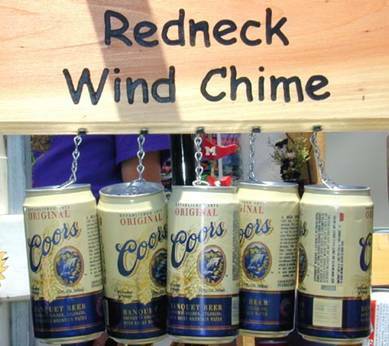 I want the redneck wind chimes but with bottles of beers from around the world! 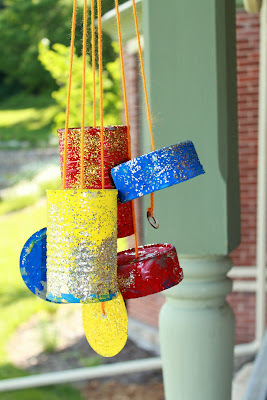 Great wind chime ideas! Thanks! Such a great blog and I’m happy to have found it. Great ideas!! i’m from alabama, so “redneck” anything is always funny to me. i love the redneck wind chimes! hilarious. I have been planning for a few weeks to make wind chimes with my daughter because we read a book about wind that she loved a few weeks ago. Then things got busy and we took a trip to visit family and it got put off until we get back to “normal life”. You have re-inspired me! Maybe we’ll just do it while we are here on our visit anyway! Great post and site! I love stuff like this!! Keep up the good work!! There’s a lot of solace in taking the ordinary and turning it into something quietly extraordinary. And making things makes us forget whatever is preoccupying us, a lot of times. Maybe this is why I like cooking dinner every night. Puts the brakes on the business day, opens the wine, puts on the music, gathers the family. These are SO cute! When my little one is older I’m definitely doing these! Great post! 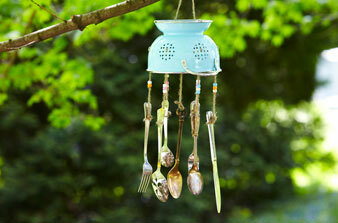 i’ve always wanted a windchime with spoons……..
Wind chimes are my moms favorite. But I would make an exception for the redneck wind chime!! Love it. Love the beer can wind chime. Might be slightly dangerous to share it though. Have you added that to Pinterest? I feel inspired to make a wind chime. Or at least add it to my list of projects that I save for summer break. Thanks. 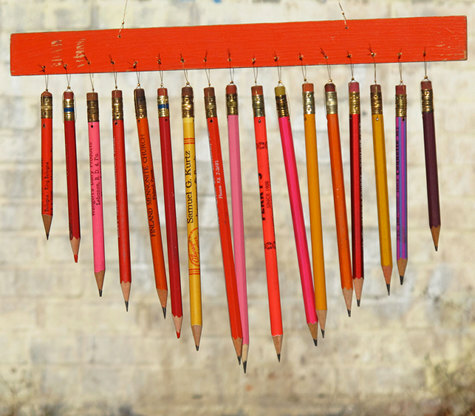 I love the wind chime ideas, a great way to recycle things in this day of wastage. When I moved into my house, I had some small wind chimes that I put in the garden, then I got some lovely bamboo ones, and my neighbour came and told me to take them down as the noise would keep her awake at night!!! So now my wind chimes are in my house. So cool – love these! Mamma likes the redneck wind chimes! We have wind chimes on our back porch. I can hear them when I’m in the kitchen. They’re very peaceful and relaxing.